Heartwood and sapwood development was studied in 18-year-old Eucalyptus globulus trees from pulpwood plantations with different spacings (3 × 2, 3 × 3, 4 × 3, 4 × 4 and 4 × 5 m), on cross-sectional discs taken at breast height. The trees possessed a large proportion of heartwood, on average 60% of the wood cross-sectional surface. Spacing was a statistically significant source of variation of heartwood area, which ranged between 99 and 206 cm2 for the closer (3 × 2) and wider (4 × 5) spacings, respectively. There was a positive and high statistical significant correlation between heartwood diameter and tree diameter (heartwood diameter = −0.272 + 0.616 dbh; r 2 = 0.77; P < 0.001), and larger trees contained more heartwood regardless of spacing. Heartwood proportion in cross-section remained practically constant between spacings but increased with tree diameter class: 55.1, 62.2, 65.0 and 69.5% for diameter at breast height classes <15, 15–20, 20–25 and >25 cm, respectively. The sapwood width did not depend on tree diameter growth and remained practically constant at an average of 18 mm (range 15–21 mm), but sapwood area showed a good linear regression with tree diameter. Therefore, tree growth enhancement factors, such as wide spacings, will induce formation of larger heartwoods that can negatively impact raw-material quality for pulping. 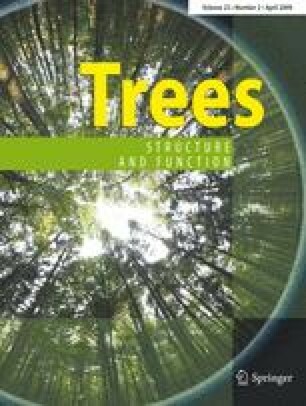 The increase in heartwood in relation with tree dimensions should therefore be taken into account when designing forest management guidelines. Financial support was provided by project POCTI/AGR/34983/2000 from Fundação para a Ciência e Tecnologia (Portugal) within the EU FEDER programme. Thanks are due to Paula Soares and Margarida Tomé for stand and tree data.